Continuing on with our theme of “you ask and I’ll answer”, I get to answer for myself today! Thank you so much for all of the wonderful and thought provoking questions you have submitted! I’ve really enjoyed doing these blogs over the past few weeks! Hope you all enjoy this one as much as the others! Do you see your Dad? He never seems to be around in the vlogs? Good observation. My father passed away when I was 13. I wrote a blog about him a little while ago. You can read all about it here. -Who were the male figures in you life who shaped you into who you are today since you lost your dad at a tender age and never had a cool relationship with your step-dad? My grandfather (mother’s father) was probably the only true constant male I had in my life. Not only was he a constant, but he was a great example to me of what I wanted to be. I spent a lot of days in my grandparents home. We lived with them when I was young after my mothers first divorce. I again was able to spend a couple of years with them during my early teen years. They were instrumental in my influence of our savior Jesus Christ and also a perfect example of what a good marriage looked like. They molded my idea of what was important in this life early and helped influence who I became. I also have to give credit to a few of my best friends fathers. After we moved to Utah, just before I started high school, I made some really close friends, lifelong friends. Their fathers were always around, and always giving me great advice. They probably don’t know how much they shaped me, but they certainly had a very strong impact on my life. -Kind of personal, but I’m curious; What are your thoughts on missions, as someone who didn’t serve one? My husband wasn’t medically able to go and I see him struggle with the stigmas attached to not serving? Great question! Many of you asked something similar, why I didn’t serve and all my other brothers did, etc. I’m always open to discuss this topic, and know there are many out there who struggle with it, especially if you are of our faith where there is such an expectation and stigma attached. Hopefully my thoughts and ideas answer your questions about my personal reasons, and also some perspective from my point of view as well. First of all, I did get a call to serve a mission for my church. I was called to serve in the Paraguay Asuncion North mission. I entered the Missionary Training Center and was there for two weeks learning my language and adjusting to mission life. At that exact same time, my home life was a mess. My mom and step-dad were going through a very difficult and volatile divorce. My sister had moved out and married just a few months before I left on my mission. That left 8 younger siblings at home with uneasy circumstances. That weighed on me heavily. Also, when you are asked to serve, you are asked to be clean and pure, refraining from sin and putting your entire faith, energy, and work towards serving the Lord and sharing his gospel. I felt like I wasn’t as dedicated as I should have been and that I also had not been living my life as clean and pure as I should have been. This also weighed on me daily. As many of you know, the MTC really gives you time to ponder how dedicated and ready you are to enter the mission field. I decided the time was not right for me to be there. I went home. Things got worse for my family before they got better (long story for another blog, or book, lol). I ended up getting a job and staying close to my family. I stayed with my mother and my siblings for a bit, but the divorce eventually separated some of us. It was a very difficult time. Half of my family went to live with my step-dad in Idaho, and the other half stayed in Utah with my mother. I think it was hard on me to not have everyone together, but I think it was even harder on my siblings who were split apart for that time. Luckily, that did not last longer than a year I believe, and eventually all the siblings came back and were able to live with my mother. It took time, but home life slowly and steadily got better after that very dark time. During that time, I made a lot of bad decisions myself. I was not a very good representative of my faith. I was struggling. I had no one left to lean on, or so I thought, and I struggled for a couple of years. Luckily I met Ashley. She really was a bright spot in a dark time for me personally. Things started shaping up from there. Personally, there are times when I regret not serving my mission. I know that there is a great amount of work I could have accomplished. I could have been a great missionary, a great companion to my elders. But that time has passed. I made other decisions and life took me a different way. Looking back now, I have used all of the experiences and circumstances to shape who I am today. I experienced a lot of bad, but it made me appreciate the good. I saw both ends of the spectrum of life and got to decide for myself which one I wanted to be on. I got to see the reality of how evident God is in our lives. He’s there every single day, every moment. The greatest lesson I’ve learned in this life is knowing that we hold the keys to our own life. We get to choose. If we want to rely on God, have faith in him, and live our lives following his teachings, we can do that, and be blessed. We can also choose to not have him in our life. I’ve experienced both, and I don’t ever want to walk without him again. He comforts me when I’m in need. He knows my heart. He’s experienced what I’m experiencing. He will never leave me alone. He also gives us second chances. Many opportunities have come my way to be a missionary. I recognize them, and I get to choose once again if I want to serve. Life is funny that way. It kind of goes in circles. I think because we’re all human and miss a lot the first few times it passes us by! -How do you think losing you dad shaped you into the dad you are today? I think there are many factors that shaped me into who I am today, but losing my father at such a young age definitely had a profound affect on me. As most of you know, growing up I never had a consistently strong male example in my life. My grandfather was always there when I needed, but sometimes we lived far away and I didn’t see him much. I’d see my Father for a couple of weeks in the summer, and talk on the phone once a month. My step-Father and I never got along, so that left me bonding with my mother for most of my life. I guess looking back now, I always wanted it to be different. In the moment, I think I just did what I had to do to make it through the day. If I was upset, I didn’t let it affect me, I just channeled my emotions into my hobbies or friendships. As I got older, and then married, I knew when we started a family I wanted to be different. I wanted to give my children something that I didn’t have. More than anything, I wanted to make sure I was around for my children. I never knew what that was like growing up, consistently having a Father to go to for advice, counsel, knowledge, or love. This affected my relationships with male figures throughout my life. I also wanted them to know without a doubt that I loved them. I grew up in a home where those words and actions were rare. I knew my mother loved me, but she rarely told me. We didn’t do hugs or anything like that. Emotions were almost hidden if I didn’t know any better. Again, that influenced my life and I’ve had to really think and overcome things that were learned to transform into something better. Something I knew my children needed and deserved! I don’t want people to think I was neglected or not loved, that wasn’t the case. I knew I was loved, especially from my mother and grandparents, it was just in a very different way than I love my children. I think I adapted to it early and just thought that was the way life was. Just like my father being gone, and my relationship with my step-father. I didn’t learn until later in life that all of this was just a result of decisions. I could be something different. I could be something better. I think we all go through experiences in life that shape us and determine who we become. Sometimes they have a positive affect, and sometimes negative. I’ve had many experiences in my life that have had both. Someday ill write a book on all of them! -Will you ever shave your beard off? What would the girls say? Hahaha. I’ve shaved before, but not since the girls. Im sure it would come as quite a shock. I look completely different without my beard. Some guys can shave and they still look the same. I look like a completely different person, and not for the better in my opinion. Ashley also loves my beard so it would be hard for me to clean shave. That being said, never say never! -What are your thoughts growing up in a large family? (Then and now). Again, growing up in a large family definitely had an affect on the person I became and shaped who I am. As most of you know, I am the oldest of 10 children. My sister Denver and I came from my mother’s first marriage, then 7 from my step-father, then the baby from another. Although we have different fathers, none of ever considered the other anything but full blood siblings. I like that we were all raised that way. Growing up and being the eldest was hard, I’m not going to lie. My mother and Step-Father places a lot of responsibility on Den and I. There was a 6 year gap between Denver and the next sibling. We learned to cook and clean at an early age, as well as care for infant babies. We rarely complained as we just thought this was part of life. We also loved babies and grew fond of each one of them. It really gave us an opportunity to bond with each sibling and have the relationships we do today with them. We were dirt poor at times, and things were tough. I remember wanting many things that I knew I would never be able to have. As long as I can remember, my mom was always stretching a dollar to make it to the next paycheck. When the babies kept coming, the dollars had to be stretched further. I have stories I could tell that would land me on Oprah, but ill save them for now. There were many tough days, but I feel they really shaped all of us into something better. My mom tried really hard to give us all that we needed to succeed. We always had food and shelter, and clothes on our backs. We may not have had the nicest things, but we made do. This shaped me as a person too. My friends would all be wearing their Air Jordans back in the day when I played sports, and I’d be happy to just have a new pair of Nike’s that fit. I didn’t need much, because I learned at an early age what sacrifice. was all about. This shaped me to become a better person, father and husband. I just didn’t know it at the time. Growing up had its ups and downs, but now that most of us are all grown up, I really am grateful for the hard time. They have given me and my siblings perspective. All of us have worked hard for what we have, and we appreciate what we have. That is important to me. We also have very close relationships, which is important to me. We see each other all the time, and interact and bond with each others children. I love how close we all are, and I think we needed a lot of those early circumstances to bond us together. We look out for one another. We love and appreciate one another. A big family to me is a great thing and a blessing! -Where did you work before you had the babies? I worked in sales for a company called BlenderBottle. I’m sure you’ve all seen their products! Best shaker cup ever! I handles accounts ranging from Gyms/Fitness to Professional Sports Teams. It was a very good learning experience while I was there. They were a great company to work for. The owners are class acts! Did you attend College? What is your degree/training in? 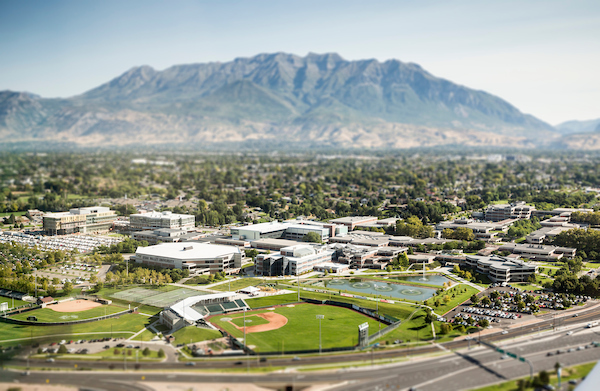 I attended Utah Valley University. My bachelors degree is in Behavioral Science with an emphasis on Psychology. I did my bachelor in 3 years and loved every second of it. College was such a fun experience for me. I love learning. My plans after graduation were to continue and get my Masters in Marriage and Family Therapy. Just after graduation, I got the job at BlenderBottle, and loved sales so much I took a break from school. Soon after, we found out we were pregnant with quadruplets, and the rest is history. -What did your family call you growing up? -If the girls do sports, will you be there coach? -What’s your favorite 80s song? And favorite Artist (Besides George Michael)? I don’t think I could limit it one on either of those, so I’ll give you a few of my top favorites! Artists: George, Bruce Springsteen, Richard Marx, Billy Idol, The Cure, Blondie, Bryan Adams. Songs: Slave to Love, Eyes Without a Face, Different Corner, Hazard, Just Like Heaven, Your Love, Every Breathe You Take, Faithfully, The Tide is High, Back in the High Life. -How did you stay strong through infertility and IVF? How did you not lose faith? What is your secret to being so positive and happy all of the time? Infertility/IVF- I’ve always had a large measure of faith. I’ve known that growing up through today. I think that is one of my best gifts God has given me. Ashley and I would lean on each other completely. When one of us needed lifting up, the other was always there. We always balanced each other out, and still do. Faith- I was taught from a young age about Faith. Still learning about it today, I have realized its a continual process. You never stop learning. Experiences are brought in and out of our lives to teach us, give us opportunities to make decisions, and learn from those decisions. Faith for me is believing in something I know exists or that I can achieve through hard work, knowledge, and experience. I think being taught the principles of Faith from a young age, watching those around me being blessed by their faith or not because of their lack of it gave me great perspective. I carried those experiences and knowledge with me through my life. They helped tremendously when obstacles and trials entered my own life. I learned to turn to God for everything, and rely on him completely. My faith grew through these experiences and I became a changed person. Im still being changed. I don’t think that ever ends. You don’t ever learn enough, know all the answers, or reach the top of the mountain. Its a continuous learning experience. I think knowing that, I’ve been able to learn so much more, all the while building my own faith. Secret to happiness- Knowing and understanding all the gifts God has given me, and also how I can use those gifts to help others. I’ve been tremendously blessed in my life and I would be a fool to not acknowledge Gods blessings, and a bigger fool to not share what I have been given with others. God is happiness. Family is happiness. Love is happiness. Being an inadequate Husband and Father. I let this insecurity motivate and inspire me. My wife and my children are everything to me. Nothing comes before them, ever! -How do you keep things fair with your girls? No matter what, I want my girls to know they will always have me in their lives consistently. No matter what the homework problem is, friend dynamic, game they are playing in, question about life, I’ll always be there 100%. For me, consistency with each of them is key. I know that as long as they always know they have me in their corner, things will always be fair. They’re going to pick different sports or musical instruments. They’re going to like different music. They’ll have different friends. But they’ll always have a Father and Mother always ready to welcome them and their questions, needs or wants with love and understanding. I really could sit here and answer questions all day, but ill save a few for next time! Hope you all enjoyed this blog! Thanks for the love and support! Here’s our most recent vlog, just in case you missed it!